​These boxes are inspired by the sailor-made ditty boxes of the early nineteenth century. Originally, made with baleen, often called “whalebone” during the whaling era, our ditty boxes are similar to Shaker boxes, with thin hardwood strips that are steamed and bent around a mold. Come take these classes and learn how make these bentwood boxes. We offer several box designs for various skill levels, from the introductory boxes with dots and applied ivory, to the more advanced boxes with multiple inlays. 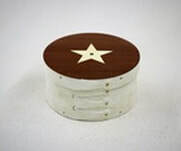 Compass Rose Ditty Box - inlaid with eight abalone dots & an applied scrimshaw compass rose. Oval Ditty Box - inlaid with ten ivory dots & an applied ivory sperm whale. Length 7”; width 5”; height 3-3/4”. Holly Star Ditty Box - inlaid with a holly star & an abalone dot. Scallop Shell Ditty Box - inlaid with eight mother of pearl dots & an applied ivory scallop shell.